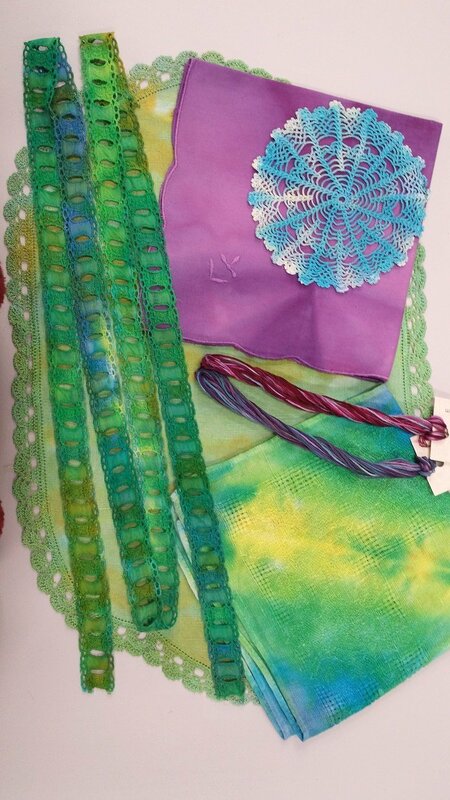 --Items to dye - These may include lace, linens, doilies, ribbons, floss, perle cotton, thread, etc. Items need to be natural, plant fibers such as cotton, rayon, linen, hemp and silk. White or cream colors dye well. Results with other colors will vary, but may be quite interesting. Depending on the size of pieces and the speed at which you like to work you may be able to dye up to a couple of dozen skeins of floss and/or a dozen pieces of linens/doilies, etc. You may want to prewash items to remove starch or sizing. They may interfere with the dye absorption. If you are unsure of the fiber content feel free to bring the item and try it. Floss, perle cotton and lace are available for purchase at Blue Bar Quilts. I usually dye my floss as it comes with no prep. I handle carefully when dyeing and then rinse each skein individually to avoid tangling. Or the floss can be prepared in advance to minimize tangling. Take the floss skein as originally wrapped and tie the two ends together. Then use another piece of yarn or thread weave the yarn thru one area of the skein in a figure 8 and tie it off. Do this in two additional areas of the skein. If you need assistance figuring this out (it is hard to put into words), you can e-mail Pam at creativearttextiles@gmail.com and we can set up a time to meet for a demo or we can make a plan to meet 1/2 hour before class begins. --Fabric pieces to put underneath the items you are dyeing. I recommend white or light colored cotton. This fabric will absorb extra dye, making its own interesting cloth, and will be the wrap for carrying your dyed items home. You will need enough fabric to lay out all the pieces you are planning to dye. These pieces do not need to be high quality cotton. --Plastic shopping or garbage bags for transporting damp fabric home. --Optional - Tools to experiment with, such as any type of small brushes, eye droppers, small sponges. etc. Note: Class is scheduled for 4 hours. The class itself is 3 hours, as for many people that is plenty of time. However, the studio is then open for an additional hour for anyone who wants to continue working.